In a letter at Global Grind, Russell Simmons explains what he thinks the rapper is missing about the goals of the movement and the "99 percent." So, Jay, here's the deal. You're rich and I'm rich. But, today it's close to impossible to be you or me and get out of Marcy Projects or Hollis, Queens without changing our government to have our politicians work for the people who elect them and not the special interests and corporations that pay them. Because we know that these special interests are nothing special at all. In fact, they spend millions of dollars destroying the fabric of the black community and make billions of dollars in return. For example, the prison lobby paid politicians to create a so-called "War On Drugs" that resulted in a prison economy that disproportionately locks up black and brown people, including many of your friends and mine. They took drug-infected, diseased people, locked them up, educated them in criminal behavior and dumped them back into our community, thus producing a jail culture for our streets. There are more black people under correctional control (prison, jail, parole, probation) today, than were enslaved in 1850, a decade before the Civil War. This is just one issue that has been bought and sold. If we have to occupy Wall Street or occupy All Streets to change the course of direction of this nation, then we must. We must take our democracy off the market and let the world know that it is no longer for sale! Mic check. 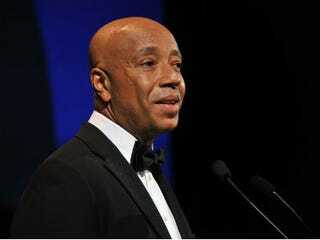 Read Russell Simmons' entire piece at Global Grind.